Ford car body colours on the Mk1 Consul, Zephyr Six, Zodiac, Anglia and Prefect. Homepage. 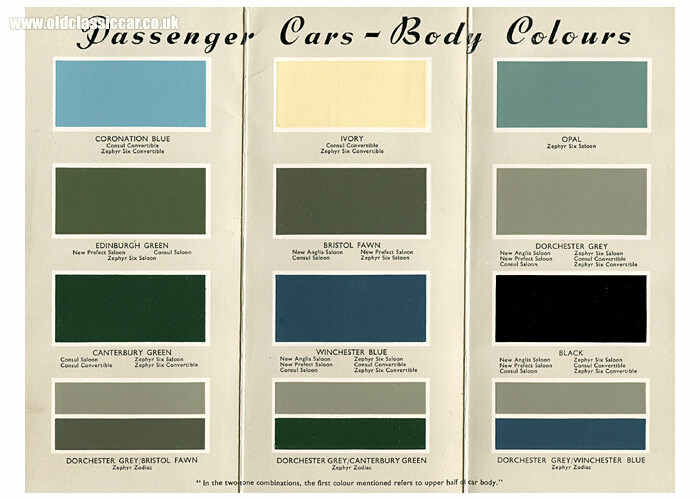 This page: A period summary of the colour options available to buyers of new Ford cars in the early 1950s. * In the two-tone combinations, the first colour mentioned refers to upper half of car body. Evidently this colour swatch dates to the early 1950s. The "By Appointment" statement on the rear cover refers to the late King George VI, he died in February 1952. The New Anglia and New Prefect, both referred to in this colour guide, landed in the showrooms during 1953, selling alongside the larger Mk1 cars. The Queen's Coronation took place in June 1953. As Her Majesty isn't referred to, I can only assume that the leaflet was printed in the early months of 1953, perhaps coinciding with the launch of the 100E. The following colour advert for the Consul and Zephyr Six features on a magazine of the day - Winchester Blue and Canterbury Green perhaps? This leaflet is from a collection of interesting items acquired from the former Welland's Garage, of Berrow. 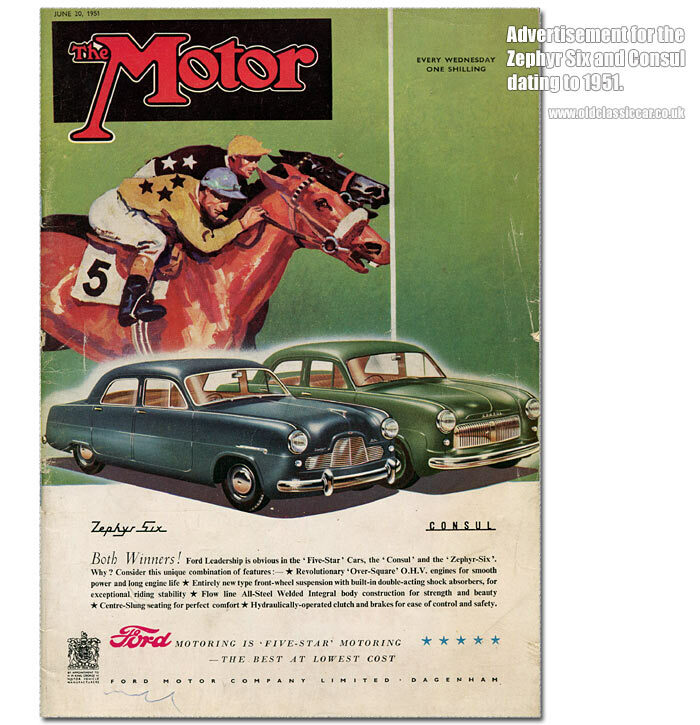 Ford cars of the era referred to in the above publications can be found in the vintage gallery of this site, for instance on the Mk1 Zodiac, Zephyr and Consul pages.